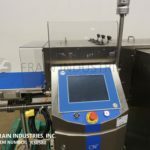 Belt checkweighers are designed to check the weight of a package, product, or container as the package passes over a conveyor that is mounted on a load cell or strain gauge. Belt checkweighers are designed with a belt conveyor to carry the product over the load cell. 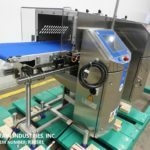 Belt conveyors are often designed with a belt conveyor to bring the product in to the load cell conveyor and a belt conveyor to discharge the product from the belt checkweigher. 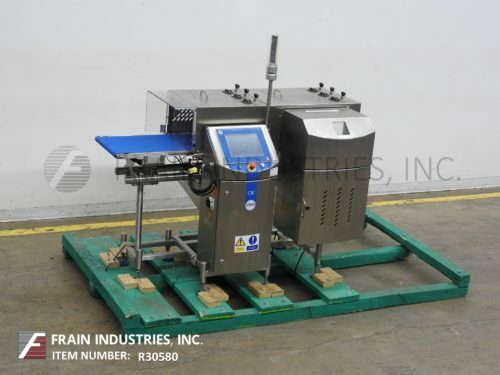 The design of the belt checkweigher requires that the package be on the load cell conveyor for a small amount of time, usually fractions of a second. The belt checkweigher design does not require that the package stop on the load cell conveyor. Belt checkweighers are designed with different length load cell conveyors. The greater the ratio of package length to load cell length, the faster the conveyor on the belt checkweigher can be run. As a general rule of thumb, the length of the load cell conveyor should be approximately one and a half times the length of the package. This package length to load cell conveyor length ratio allows for a wide range of production speeds for the belt checkweigher. 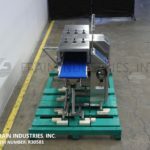 The discharge conveyor can also be used as a reject conveyor, if the checkweigher is designed to have a reject system. 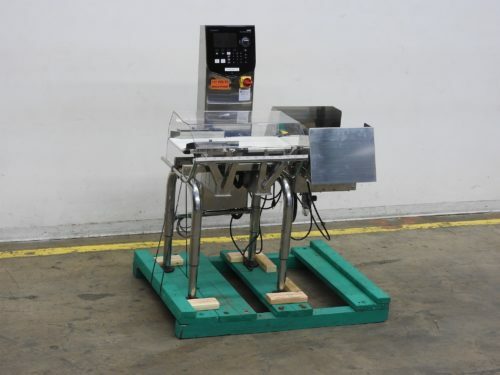 Checkweighers can be designed with indicator light rejects, conveyor stop rejects, air rejects, pneumatic are rejects, diverter gate rejects, or drop nose rejects. Load cells and strain gauges are designed to take an electrical signal as an input and to measure the electrical output as the indicator of weight. The input electrical signal is of a given voltage and the load cell is designed to pass this signal through a resistor. As the weight on the load cell increases the resistance of the resistor also increases, resulting in an output voltage that is different than the input voltage. The checkweigher determines the weight of a package by comparing the output voltage signal to the input voltage.